The DCI Fan Network presents its next live webcast of the season Saturday, July 23 from the DCI Southwestern Championship in San Antonio, Texas. 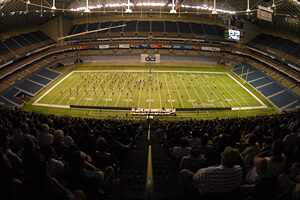 Starting at 2:30 p.m. CT, you'll be able to watch the complete performances of some of DCI's top corps online and in real-time from the Alamodome in downtown San Antonio. The lineup includes: 2:30 PM – Forte 2:47 PM – Genesis 3:04 PM – Revolution 3:21 PM – Pioneer 3:38 PM – Teal Sound 3:55 PM – Cascades 4:12 PM – Mandarins 4:29 PM – Intermission 4:46 PM – Pacific Crest 5:03 PM – Crossmen 5:20 PM – Colts 5:37 PM – The Academy 5:54 PM – Spirit of Atlanta 6:11 PM – Glassmen 6:28 PM – Intermission 7:30 PM – Blue Knights 7:47 PM – Troopers 8:04 PM – Blue Stars 8:21 PM – Boston Crusaders 8:38 PM – Madison Scouts 8:55 PM – Santa Clara Vanguard 9:12 PM – Intermission 9:29 PM – Phantom Regiment 9:46 PM – The Cadets 10:03 PM – Bluecoats 10:20 PM – Blue Devils 10:37 PM – The Cavaliers 10:54 PM – Carolina Crown 11:20 PM – Awards Ceremony Time approximate and subject to change. Two ways to view this webcast are available. A $24.95 pay-per-view option will give you one-time access to watch all of the performing corps. Choose the $79 Live subscription option, or Live+DVD or Live+Blu to gain complete access to all 2011 webcasts, on-demand replays of select DCI Tour events, discounts on downloadable media, and more! Learn more about all Fan Network subscription levels.